Spice blends take the guesswork out of international tastes while leaving plenty of leeway for experimentation. “We have seen a growing trend in Middle Eastern spices with the rise of chefs like Yotam Ottolenghi and Sabrina Ghayour, such as za’atar, harissa, sumac and baharat. This is coupled with the availability of other Middle Eastern ingredients like halloumi, pomegranate molasses and orange blossom water in the wider market,” says Sanjay Aggarwal, co-founder of Spice Kitchen, the award-winning producer of freshly ground spices and blends. “ Indian and Persian tastes are experiencing a resurgence, with increased demand for flavours such as garam masala, cardamom, chai spices, saffron, rose and turmeric,” says Gouri Kubair, managing director of Holy Lama, whose Spice Drops range consists of 31 highly concentrated, all-natural liquid extracts of herbs, spices, fruits and flowers. 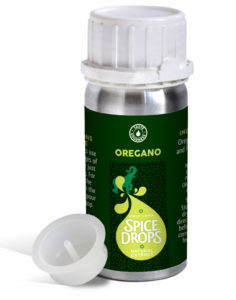 The authentic Indian meals Kubair sees replacing Bangladeshi and Anglo-Indian dishes demand very specific blends, which Spice Drops’ dispenser droppers can achieve. A stream of chef enquiries has prompted Holy Lama to launch a Mediterranean subset of Spice Drops aimed at caterers, featuring rosemary, oregano and sage. US chefs, reports Mintel, are using flavoured oils and vinegars to offset sweetness in desserts and baked goods, with rosemary olive oil cake and Cheerwine vinegar pie. Il Gusto’s new collection of 25 white and dark Modena balsamic vinegars can jazz up a wide range of foods – meats, fruits, salads and pan sauces – with flavours ranging from light, fruity mango and passion fruit to richer options such as fig and pomegranate, truffle and chocolate. 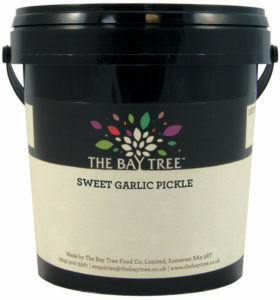 The Bay Tree pairs fruit and spice to balance the flavour profiles in its pickles and chutneys, with mango/cumin, apricot/ginger, and gooseberry/coriander. Its top-seller, the award-winning sweet garlic pickle with nigella seeds and cinnamon, can be used as a curry accompaniment or as a marinade for roast lamb. Sweet Beet’s Hodcroft has adapted smoky Texan flavours to British tastes in her quest “to harness the bold, tame the heat and declare war on the mundane” in condiments that include oak-smoked apple butter and habañero lime and Texas beer jellies. Sweet Beet’s Great Taste Award-winning maple bacon jam can be used in burgers and sandwiches, as a rub and in a sauce or marinade, while strawberry chipotle barbecue is equally at home with meats and desserts. Chinese food recently overtook Indian as Britain’s favourite regional cuisine and Maria Chong, managing director at Lee Kum Kee Europe, says street food and a growing desire for authenticity are spurring interest in flavours from its wide range of concentrated sauces, which are finding surprising new applications in Western dishes. 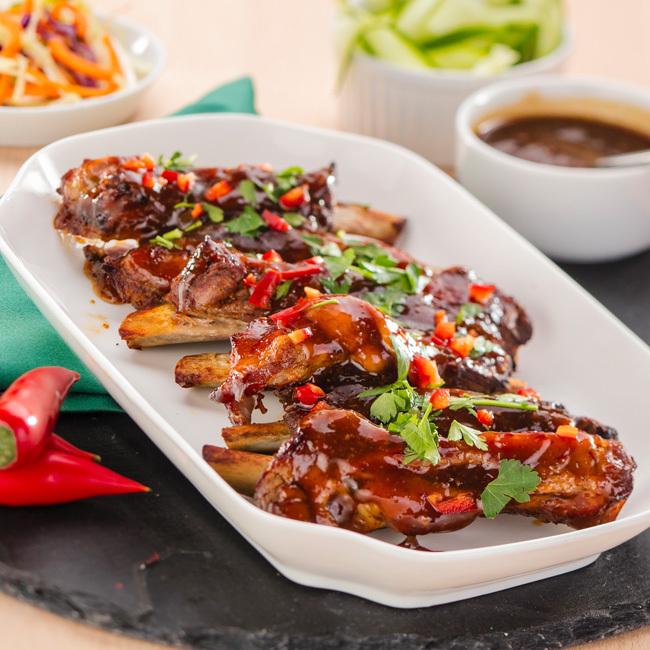 With sweet chilli sauce now mainstream, chefs are turning to alternatives such as Lee Kum Kee’s distinctive Chiu Chow chilli oil and chilli garlic paste to enliven mashed potato and mayo, ribs and wings. Chong has seen oyster sauce used as a marinade for roasts, ribs, stews and a savoury-sweet plum sauce as a glaze on vanilla ice-cream. Aggarwal reports rising interest in Japanese flavours, such as the seven-spice togarashi with sansho peppers, while a recent Mizkan survey found that 80% of consumers are familiar with at least one East Asian condiment, such as Japanese wasabi, teriyaki and sushi-su, Thai sriracha and Korean kimchi. With street food tipped to remain a dominant force, Lee Kum Kee offers an on-the-go Hot Wok Kitchen portfolio of sauces and recipes as well as serving cups and training. AAK Foodservice is targeting this sector with Lion Sauce’s world flavours collection. The 17 options in the range include hot adobo sauce, hummus mayonnaise and ginger, chilli and garlic sticky sauce, while the Americana category includes a Californian herby buttermilk dressing and a Creole-inspired Louisiana barbecue sauce. Many also cater for vegetarians, vegans and flexitarians (Lion is launching vegan mayonnaise this summer). AAK brand manager Sarah Moor suggests serving jackfruit slow-cooked in maple and bourbon barbecue sauce in a bun, a taco or with rice. Mintel reports that savoury flavours are entering veggie fare through meat-associated processes – curing, grilling and smoking. Pastrami spices or buffalo dressing could be used on tofu or halloumi. As for future flavour trends, Mintel is backing kokumi – a sister to Japan’s umami ‘fifth taste’. With kokumi, ingredients such as yeast extract and fermented soy generate rich, complex and harmonious flavours similar to those that are achieved by slow-cooking, ageing and ripening and – great news for the health-conscious – add an oily richness and saltiness to low-fat and low-sodium foods. The rich flavours of East Africa, Japanese izakaya bites and hand-held street food fusions are the top tips in this year’s McCormick flavour forecast. • Ethiopia’s hot, sweet, citrusy berbere blend of spices, such as paprika, allspice, coriander, cardamom, ginger, cinnamon, red pepper, basil and garlic, can be rubbed onto meat, stirred into stews or sprinkled over vegetables. 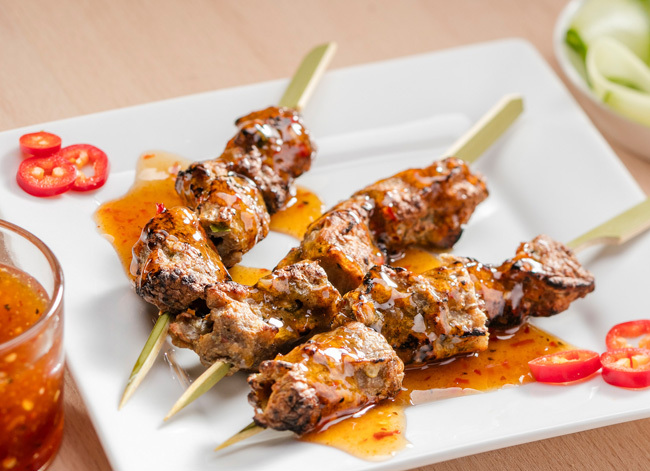 • Mishkaki are Tanzanian barbecue meat skewers marinated in tenderising lemon, tomatoes and green papaya mixed with curry, garlic, red pepper and ginger. 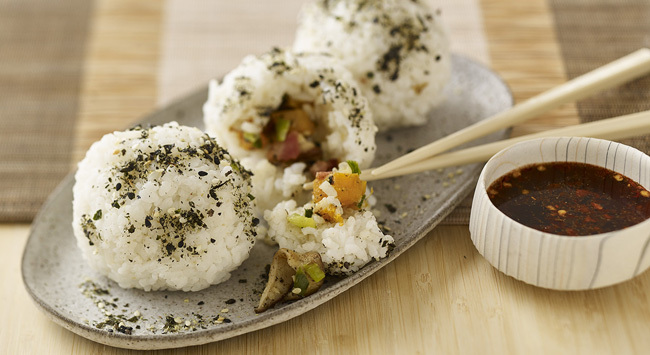 • Onigiri are stuffed rice balls (filled, for example, with ginger- and plum-infused chicken) sprinkled with a sweet umami furikake seasoning of seaweed, sesame, dried seafood, sugar and salt. • Grilled chicken and seafood skewers with sweet-and-savoury miso sake yakitori glaze. • South American arepas – crispy corn or plantain cakes – filled with grilled steak, vegetables and Greek tzatziki sauce. • Griddled egg crêpes, rolled like burritos around popular US fillings such as smoky pork, slaw and tangy Southern-style sauce. Mizkan’s research reports that 40% of customers prefer their sauces served in a branded bottle, compared with 25% opting for a ramekin. Brand loyalty is especially strong among 18- to 35-year-old diners, according to a recent survey by McCormick Flavour Solutions, which found that 72% of UK millennials are more likely to use a table sauce by a well-known brand. It is offering caterers a free full-size bottle of Frank’s RedHot original cayenne pepper sauce or French’s classic yellow mustard – America’s top-selling mustard and hot sauce brands – to trial their ‘iconic status’ among this demographic. Tabasco – Britain’s top-selling hot sauce brand – has a table-top range to match consumers’ growing interest in (and varying tolerance to) different types of chilli peppers – from hot habeñero to smoky chipotle and mild green jalapeño. The versatile original can brighten up everything from pasta, meats and ramen to avocado on toast and popcorn. Portion-controlled mini jars are also proving popular. “Our savoury range of Tiptree tomato ketchup, brown sauce and English wholegrain mustard is ideal for breakfasts and buffets, while our hot gooseberry chutney and onion relish work well with a cheeseboard,” says Scott Goodfellow, joint managing director at Wilkin & Sons. 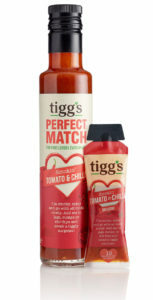 Tigg’s mini sachets (including its new smoky tomato and chilli) also tap into the grab-and-go market. “Tiny Tigg’s can be placed at the till point or in a bowl on tables for consumers to customise dishes with their favourite flavours. Whether it’s our cool basil and pea on a pasta dish or bold beetroot and honey drizzled over a salad, there’s an option for everyone,” says co-founder Jacob James.